Pictured at Red Lake are (back row from left) ESPOCH student and Verde Sumaco youth member Jairo Calapucha, ESPOCH professor Fernando Romero, Lakehead Natural Resources Management associate professor Brian McLaren (co-investigator), ESPOCH professor Patricio Lozano, Lakehead Geography associate professor Martha Dowsley, Lakehead Outdoor Recreation, Parks and Tourism associate professor Rhonda Koster, Lac Seul First Nation guide Kaaren Dannenmann, (front row from left) Verde Sumaco guides José Calapucha and Raúl Shiguango, Martha’s daughter Charlotte, and Frederico Oliveira (principal investigator). 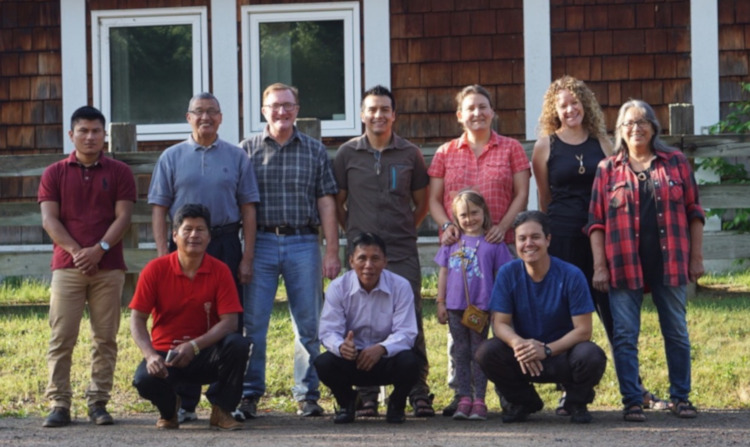 Earlier this year, faculty, staff and students from Lakehead University, York University and partner university Escuela Superior Politécnica de Chimborazo (ESPOCH) visited Indigenous leaders from Ecuador and Ontario in traditional territory belonging to Comuna Kichwa Verde Sumaco and Lac Seul First Nation. The goal of this pilot project, funded by SSHRC Connections, is to seek solidarity in overcoming challenges and describing opportunities in nature- and culture-based tourism. The stage was set in February in Verde Sumaco with the Ecuadorian Amazon as the backdrop for teachers and learners including Kaaren Dannenman and Tom Chisel of Lac Seul and Raul Shiguango and Jairo Calapucha of Verde Sumaco. In July, the settings for continued teaching and learning included the Lac Seul Events Centre, the Red Lake Indigenous Friendship Centre, and points of interest around Lac Seul and Trout Lake. “In the communities we were welcomed with open arms, and the university exchange allowed us to begin planning sustainable and culturally appropriate tourism,” said participant José Calapucha of Verde Sumaco.